Canada Set To Go Ahead With Arms Deal, Saudi Arabia Says A senior Saudi official told journalists Monday he believes that Canada will honor its $13-billion agreement, contrary to the Canadian prime minister's comments in December. 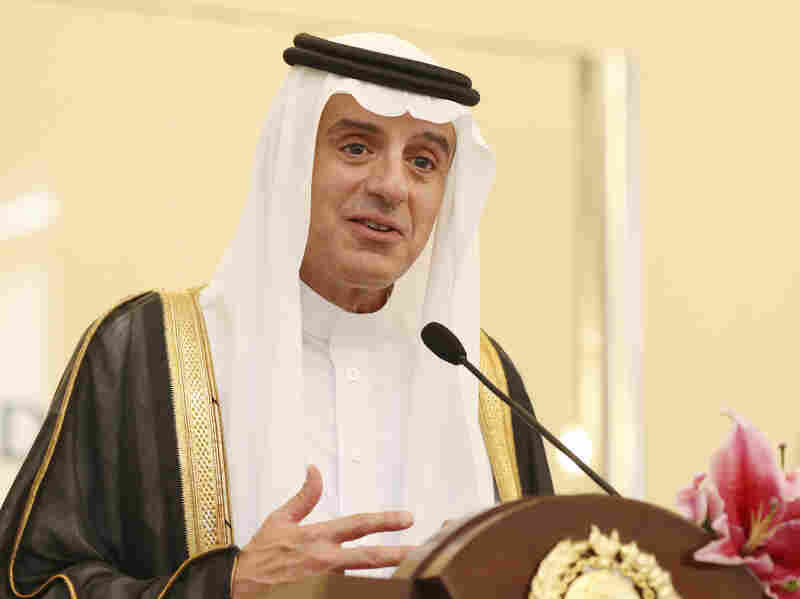 Saudi Arabia's Minister of State for Foreign Affairs Adel Jubeir spoke to journalists in Indonesia on October 23, 2018. Saudi Arabia's Minister of State for Foreign Affairs Adel Jubeir told a news conference on Monday, "Regarding the Canada arms deal, we see the Canadian government going ahead with the deal, so the statements are for domestic consumption." Jubeir did not expand on his comments. A spokesperson for Canada's foreign affairs ministry did not have an immediate response to NPR's request for comment. Trudeau told Canada's CTV in an interview on December 16, 2018, that Canada is "engaged with the export permits to try and see if there is a way of no longer exporting these vehicles to Saudi Arabia." He cited the killing of journalist Jamal Khashoggi inside Saudi Arabia's consulate in Istanbul as one reason to scrap the contract. Critics have also pointed to Saudi Arabia's involvement in the war in Yemen and other human rights abuses in an effort to pressure Ottawa to cancel the arms sale. At the time, General Dynamics Corp. in Canada, which makes the armored vehicles for sale, warned that Ottawa would incur "billions of dollars of liability" if it unilaterally abandoned the agreement. Trudeau indicated in October that his government's hands were tied by the contract, and that it would cost a penalty of $760 million to cancel the deal. General Dynamics declined to comment for this story. The $13-billion deal to sell military vehicles was struck under the administration of Trudeau's predecessor, Stephen Harper. Canada's former ambassador to Saudi Arabia, Dennis Horak, defended the arms deal, even after he was expelled from the country over a diplomatic row in August 2018. "The equipment we're selling is governed by (the) export controls regime, which is strong and it's enforced, and we've been selling some of this equipment to them for more than 25 years," Horak told CBC News. "We don't have a record of them using these particular vehicles and this equipment for abusing human rights." Tensions between the two countries escalated last August after Canadian Foreign Affairs Minister Chrystia Freeland criticized Saudi Arabia over human rights abuses. "We are always going to speak up for human rights; we're always going to speak up for women's rights; and that is not going to change," Freeland told a news conference in August.